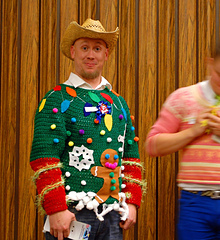 I designed a sweater for my husband to wear in the Ugly Christmas Sweater contest at the church Christmas party. (He won, hands down!) This sweater is fast and simple to make. 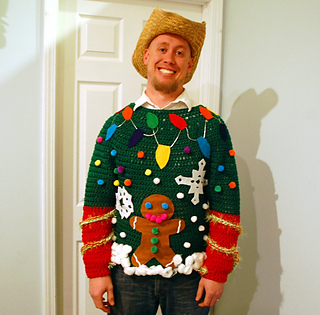 Seamless top-down construction lets you try on as you go in case you need to improvise some alterations, and it makes the perfect blank canvas for some tacky Christmas craziness.